» Is It Profitable To Make An App? 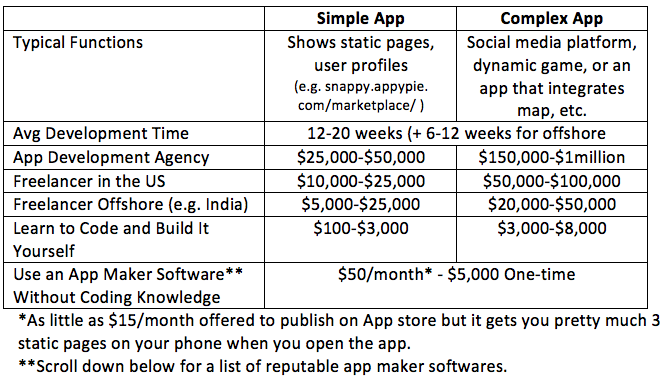 How much it costs to build an app depends obviously on the type of app you want to build. If it’s a complex enterprise app where you want your customers to have customized login profiles and have the ability to do dynamic functions, then this will involve a backend server. These kinds of apps cost at least $150,000 to over a million dollars. COST: How much does it cost to build a simple app (i.e. what is the minimum amount required to build an app and to maintain it? REVENUE & PROFIT: How much can one generate from such an app? What is the ROI? Are there other costs associated once the app is built? As someone with no coding experience but wants to build a passive income business with sweat equity and minimal dollars invested, the two obvious choices are learning to code yourself or using an app maker software. There are online courses you can take for as little as $15 for the introductory class, eventually taking several more to be able to code. Or, there are in-person bootcamp classes you can take. They are offered in metro cities all over the world. They usually run for 12 weeks and cost ~$5,000 on average. Some of them also help you get a job after. Personally, I would love to one day learn to code, but right now, my aim is to publish an app as soon as possible, so for the remainder of the profitability analysis, I will focus on building an app via (1) app maker software and (2) offshore freelancer. Unless your app is Craigslist style, you’ll end up having to make your graphics through a freelancer. This will cost $500-$1,000. App maker software has templates and stock photos you can select. Assuming this is the minimalist route, we will assume you forego the extra graphic design cost for this option. Once you publish your app, you will have to make upgrades every year. The average cost to upgrade and maintain for 2 years was found to be twice that of the cost to build (i.e. cost to build was 35% of total costs for 2 years). This would affect the app maker software as publishing it multiple times means you need to upgrade to a more costly membership. In addition, publishing your app on the App Store costs $99/year. Unfortunately, building the app alone is not enough. In order to have the potential of generating revenue, you need people to download the app. 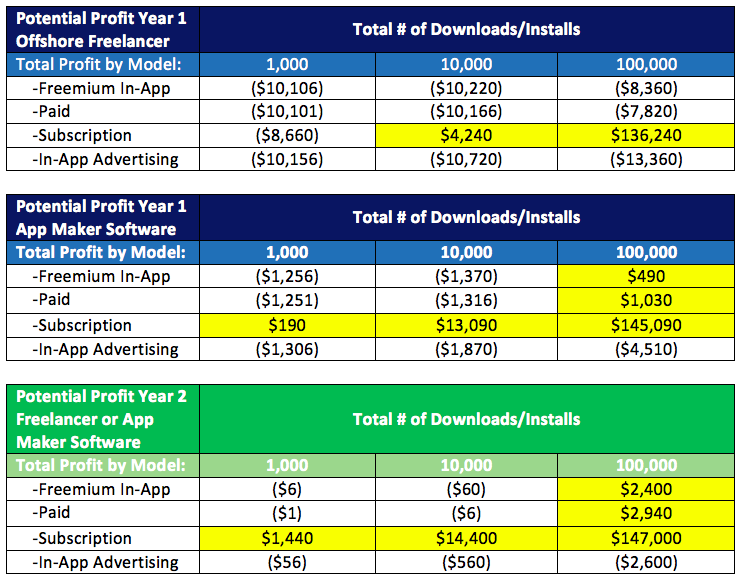 This Cost Per Install (CPI) is basically a measure of how much marketing dollars you spend divided by how many users you acquire. The average Cost Per Install for an iOS app in 2015-2016 was $1.64 in the US and $1.24 globally. Non-game CPI is lower at $0.58 for an iOS app globally. The business model you choose for your app is sensitive to the type of app it is and how users have typically engaged with similar apps. If, for example, your app is a social photo-sharing app like Instagram, you would not have any luck charging a premium to download (unless your app has something special that Instagram doesn’t). If your app is a specialized post-grad educational tool that currently does not exist in the App Store, then you’ll have better for this type of app in charging a premium like $19.99 to download. The most popular business model is the freemium model, whereby it is free to download and play, and users can make in-app purchases. Top games that generate millions of dollars have seen the most success with this type of business model. Pay to Download: Charge a free to download. In-App Advertising: Free to download and use but advertisements show on the screen outside of the control of the user. Below we look at each of these models and the potential revenue it could generate based on further assumptions. Using these assumptions, potential revenue generated from in-app purchases for 100,000 installs is over $5,000. For the user, it’s free to use the app but at the expense of watching forced advertising videos or banner ads flashing at the bottom or top of the app. The effective Cost Per Million (eCPM) is how much the advertisers will pay you for every 1,000 impressions, i.e. for every 1,000 times the advertisement is displayed to the user while using the app. In 2015-2016, the average eCPM was $4 for iOS apps. The revenue is the lowest compared to the other models. You need a lot more users in the app, especially with the downward trend in CPM that advertisers will pay. Putting it altogether (the costs and revenue by business model), below is the total annual profit in the year it launches and in year 2. Note: Cost Per Install was assumed to be an intermittent cost as marketing campaigns were launched in successions. The takeaway is that unless you’re confident that your brand will promote the app on its own and thereby not requiring the cost per install, CPI will be a huge component of your cost. With CPI, your app will start becoming profitable after it reaches close to 100,000 downloads. Of course, if it’s subscription based, you will start being profitable with much less downloads. And on the other end of the extreme, in-app advertising will require you to have a lot more downloads and users for you to break even. If you want to go down the subscription path, you need to think of an app for a niche, targeted audience who will see great value in paying $10/month for your app. Previous Post How Much Can You Make on Airbnb? Next Post How Much Can You Make as a Travel Blogger?